The Circulation Booster combines centuries-old Eastern medicine and Western technology to give you a full body treatment. Relax and let the machine's complex waveforms stimulate the reflex zones in your feet, in turn providing relief from common ailments and aiding general good health. 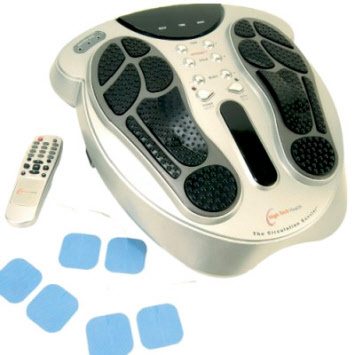 Introducing The Circulation Booster (Electro-Reflexologist) ~ a totally different approach to pain control. The Circulation Booster can assist in improving your circulation and in relieving the symptoms of sore or cold feet, unsightly veins and swollen ankles that can make daily living uncomfortable. Traditional circulation treatments can be difficult & expensive to administer and may often yield patchy results. Thanks to The Circulation Booster, a growing number of people are discovering a better, pain-free way of life that's drug-free and non-invasive. The Circulation Booster is the best available device to improve lower leg circulation. It is approved by the Australian TGA to stimulate the lower body muscles through the nerve points in the feet. Helps to improve blood circulation, relieve stress, fatigue, aches and pain, provide immediate help with arthritic pains, can aid fast recovery from muscular injury. Rebates are available from some health funds. This device comes with 3 sets of body pads to target specific body aches and pains. It also features a remote control for ease of use. Even in the most difficult of circumstances, the Circulation Booster has produced outstanding results in helping circulatory problems. Using medically approved static currents and a series of varying waveforms, the Circulation Booster stimulates the nerves to promote muscle action which improves circulation, relieves and prevents many health conditions and it also provides a general full-body reflexology treatment. You can easily manage the intensity and duration of the therapy using the supplied remote control. Use the body pads to target specific points of pain such as sore knees, back pain or strained muscles, or apply the pads to various acupressure points. For best results use The Circulation Booster for half an hour daily. Be seated and place bare feet on the foot pads and/or apply body pads to selected areas. Select your desired intensity level for foot and/or body pads using the remote control or control pad. Sit back and allow your muscles and reflex points to be stimulated. Q: Is The Circulation Booster safe for everyone? A: Pregnant women and heart disease patients should seek medical advice before using The Circulation Booster. Q: I have diabetes, will The Circulation Booster be suitable for me to use? A: Definitely. A major side effect of diabetes is poor circulation in the extremities; this can become a serious condition. Using The Circulation Booster regularly will assist in keeping blood circulating in these areas. Q: I don’t have the time to use The Circulation Booster for 30 minutes per day, how can I get the benefit? A: You can easily incorporate The Circulation Booster into your day by using it whenever you are in a seated position for more than 10 minutes. Many people choose to use it while watching TV, reading or at the computer. Q: I suffer from poor circulation. How often can I use The Circulation Booster? A: We recommend that for best results you use The Circulation Booster for 30 minutes daily. However, you can use The Circulation Booster up to 6 times per day, at up to 1 hour per session. To avoid muscle aches and tiredness, you may need to begin with less time and steadily increase your sessions. Q: Will I get best results from using The Circulation Booster on the highest setting? A: If the treatment feels comfortable and you can see and feel your muscles being stimulated you are likely to be on the right intensity setting. Using an intensity setting that is too high can overwork your muscles and reflexes, which may result in pain, fatigue or aggravation of an existing symptom. Likewise, using a setting that is too low will not be beneficial. “I wish to inform you of the incredible success I have had with The Circulation Booster. I am a 28 year old mother of two and suffer from chronic lympheodema caused by white-tailed spider bites and damage from the resulting treatment. Two and a half years of intensive physiotherapy and lymphatic drainage massage saved my legs from amputation. However, since then my legs had become more swollen, stiff and purple in colour. The weight of my legs could only be described as dragging two big lumps of concrete around. When the stiffness was at its worst walking was impossible. I started using The Circulation Booster on 26th April this year. Within the first three days, my legs began to feel much lighter almost as if I was floating. The swelling in my feet had gone down so there was space between my toes. The stiffness was also easing in my joints and I was able to bend my knees. When three weeks had passed I have noticed a definite colour change to my feet. My toes, which were black, are now a much healthier pink colour. “I was diagnosed with progressive MS in 1992. The major disability is to my legs and major deterioration has occurred progressively during the past 6 years. It has been getting worse every year. My right leg is the main problem. I wear a foot brace from calf to heal to stop foot drop. Insomnia has been a significant problem. I am currently undergoing Mitoxantrone treatment (seven treatments) to stop the MS progressing. I have had four treatments (one treatment every three months) and I have been going down hill since starting. I haven’t levelled out. I received The Electro-Reflexologist (ER) on Thursday 18 March. I used it twice during the afternoon and night on intensity 10 for the sole and intensity 15 for the electrode pads on the right knee. That evening I could actually bend my leg 15 to 20 centimetres where I had not been able to bend my leg at all for the past four years. I went to bed that night and had tears in my eyes because I was so excited at how fast the ER had worked and how rapid was the improvement. I couldn’t get to sleep due to the excitement however when I got to sleep I slept very well and I have slept well since. I used ER on Friday 3 times (each therapy 30 minutes) on intensity 10 (sole) and intensity15 (knee - pads). I was able to walk better. Before using ER, when I stood I had back pain and I had to grasp something to support me. On Friday I found that I could stand unaided and there was no pain in my back. I could stand really comfortably as if I had no disability. On Sunday I went to the Club. Normally I walk from the car to the first available seat with a walking stick - and I struggle. On Sunday I walked into the club without a walking stick and without support and without stopping for a rest. The people I was meeting were over the other side of the club and that made the distance greater. I still can’t pivot on my legs so I had to be careful not to collide with other patrons carrying drinks. Talking on the phone to you I’m standing and I’m bending my right leg about 15 to 20 centimetres. My hamstring hurts from lack of use. I do upper body exercise and I am starting exercise on my right hamstring to strengthen it. I have an automatic car and I drive with my left leg and push my right leg out of the way. My aim is to be able to drive with my right leg. - W. Pratt, NSW - Since we received this testimonial Mr Pratt has informed us that he is walking better, has improved balance, can bend his leg to 45 degrees, can turn over in bed and is sleeping like a baby without pain keeping him awake). “I purchased The Circulation Booster for the centre and also my personal use just before Christmas last year (2003). I have had four leg ulcers on my lower legs over the past years and both legs have been stripped of varicose veins. I have had numerous injections to close down leaking veins in both legs. I wear surgical stockings when the legs swell and become tight with the fluid pressure. I also have regular acupuncture and massage treatments. I have found all three of these treatments have helped me to carry out my daily tasks. The Circulation Booster has benefited me personally by helping with the venous flow from my feet and lower legs back to the heart. I have noticed the lower legs and feet look a healthier colour, my feet feel easier to walk on, they are not tight and sore like they used to be. My lower legs also feel much better as the circulation has been improved dramatically. I can honestly say that The Circulation Booster has benefited my feet, lower legs and blood, as the old blood is pumped back to the lungs and heart, and this improves blood circulation and therefore a person’s health has to improve over time. Results... or your money back! So strong is our belief in The Circulation Booster, we'll give you a 30-day money-back guarantee to ensure you're completely satisfied that this is the right health tool for you. The Circulation Booster has been designed to ensure that you get years of use from it. It comes with a comprehensive 1year warranty and unlimited Customer Service Support to ensure that you have years of enjoyment.